India and World: History, Geography, Economy and Politics – Part 1 - Freeway! 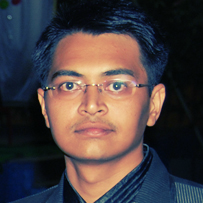 If we look back at history, India has come a long way to stand firmly in this selfish world. Every other major country goes after its own self interests but not us. Our deep rooted history tells us that, we have always been a sensible, emotional and dignified region on earth; the fact that India never attacked any other country for the sake of territory expansion, supports this very argument. But we have always retaliated strongly, if someone ever tried to put weight on our neck and destroy our cultures. Here is a verse from Bhagvad Gita, which Lord Shri Krishna told to Arjuna during Mahabharata, which ethically supports the last sentence of above paragraph. This is just an analysis of historical events through bird’s eye view with facts and their impact on India and rest of the world geographically, politically, historically and economically. If I am missing anything then do let me know. Alright, let’s see each of these events one by one. Europeans used to trade via sea route that was passing through the middle east (see the blue lines). 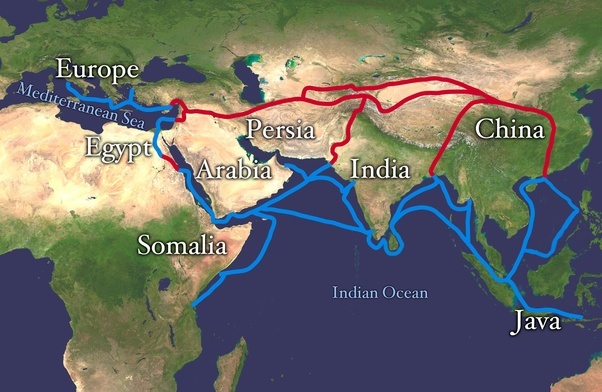 But post 13th century due to rise of Islamist powers in middle east (Persians and Arabs), they wanted the alternate silk road to continue trade with Indian region (read south Asia including todays China) as Islamist rulers in middle east were creating hurdles for them. So, they used to send sailors for explorations to find new sea routes. Columbus was sent for the same reason by King of Spain. Instead of India, he reached the east coast of America and met the native tribes, he called them Indios (Indians in Español). It is believed that till his last day, Columbus was not aware of the fact that he has landed on another region but not India. You can refer this answer on quora. Why America became so strong? Well there are few things which I can think of. Newly found American continent was full of natural resources, as it was not inhabited before except by the tribals. So, Americans had probably lesser dependancies on other countries in terms of natural resources. Europeans who went to America, were already wealthy (probably) and knew industrialisation, education and had well established links for trade with Asia and Europe. America got independence on July 4, 1776, probably the first country to get independence from British in modern world. The democracy is one of the oldest and well established from the beginning. I will not go on explaining how Abraham Lincoln led the successful American Revolution assuming you know it already. Though it was ruled by British, it might not had much larger negative impact on lives of its people in terms of culture and economy, since the people were British/Europeans themselves. British in those times, never cared about native tribes, in fact till today, tribal people are having some issues with US government. World War II, through which America came out stronger and established Her supremacy over the world. I will write about this in detail in next posts of this series. If there would not have been India, then believe me, America’s existence would have been similar to the star in the sky on full moon night. India or the whole Indian subcontinental region was super rich till 14th or 15th Century. (India was known as land of Gold.) It was biggest stable economy in the world with Vedic education, culture and traditions. But after invasion of Mughals, Europeans and British things started to decay. Culture, religion, traditions and Education systems were contaminated by the invaders, specifically British rulers. Divide and Conquer was their art of ruling. They looted (including the Hindi word ‘Loot’!) the country and piled up their huge treasures. In July 2015, Dr. Shashi Tharoor, a well-known orator and former MEA of India during Congress regime, had delivered a brilliant, factual and fiercest speech in debate organized by Oxford Union Society in UK, which was commended by many all over the world. He explained how British looted India with historical facts and demanded reparations. And no wonder that, the sun never set on the British Empire, because even God couldn’t trust the English in the Dark. It is believed that total wealth, Mughals and British looted from Indian region, can be approximately calculated to several hundred trillion Pounds. But there cannot be any valuation of the losses for moral, educational and cultural values, which is very very huge. Britain will have to sell themselves if they decide to repay the debt, but that is highly impossible. And of course, today’s Britain is not responsible for colonization, but they should never forget that foundation of their nation is laid upon blood and wealth of Colonies. One more thing, if there was no Mughal and British invasion, then we would not be having this conversation and the world’s business language would have been Sanskrit and India would have been a biggest precious jewel (larger than Kohinoor!) of the earth. I hope, someday, we will be able to restore our values by filling in the gaps and take back India to the same or even greater heights of glory in future of civilization. Thanks for reading, stay tuned for the next posts.